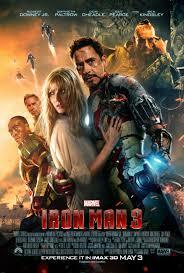 This weekend I saw the third and possibly final installment of Iron Man. I am a huge fan of both Robert Downey Jr. and Marvel, so naturally Iron Man 3 was one of my most anticipated movies of the year. When elusive terrorist The Mandarin (portrayed by the wonderful Ben Kingsley) badly injures Stark Industries security chief Happy Hogan in a bomb attack, genius billionaire philantropist Tony Stark vows to take revenge. Stark escapes when the Mandarin destroys his home, but with insufficient power to his only remaining armor, he has to depend on his wits to find The Mandarin and rescue his girlfriend Pepper Potts (Gwyneth Paltrow). Writer and director Shane Black added two things to the Iron Man formula: he heavily featured Tony Stark's search for self on one hand, and he actively played the humor card on the other hand. The plot won't change the world, but if you like action movies and you want to be entertained, then Iron Man 3 will not disappoint.